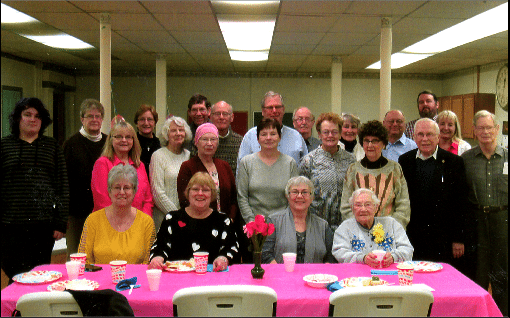 Pilgrim Memorial and First Congregational United Church of Christ recently held a 100th birthday luncheon for Anna Sweet, whose birthday was Feb. 10. Sweet was a valued member of the Pilgrim Women’s Group. Seated next to Anna, wearing a corsage, is her daughter, Judy Lord. The pair is surrounded by church family and friends. Anna was presented with a letter, pen and pin from Jamestown Mayor Sam Teresi.